I am thrilled, surprised, honoured and humbled to be one of three joint winners of the 2018 EMCC Supervision Award. I am really grateful to those who took the time to make nominations, to the judges for their time, and to the EMCC for highlighting the importance of supervision. I was also thrilled that one of my supervisors, the amazing Professor Tatiana Bachkirova, is another of the three winners, alongside Angela Wright. Over the near decade since my coach supervision training I’ve been fortunate to work with the most amazing, supportive people as supervisor, writer, and researcher. In particular I would like to thank the 150+ people who have helped make the Global Supervisors’ Network (GSN) – which provides CPD for trained and qualified supervisors – such a successful community. By January 2019 we’ve run 80 webinars at no cost to members to join or attend. Volunteering has also provided wonderful opportunities, with the EMCC, on supervison and ethics, with the AC and APECS as an assessor and on important humanitarian projects as a volunteer supervisor, like CoachActivism with refugees, and most recently through the GSN as a supervision partner to EthicalCoach, for charities and non-profit organisations. 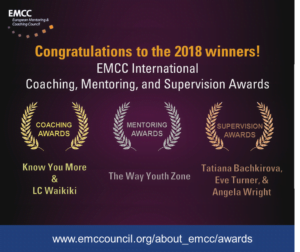 The 2018 Coaching Award joint winners were Know You More & LC Waikiki and the Mentoring Award went to The Way Youth Zone.